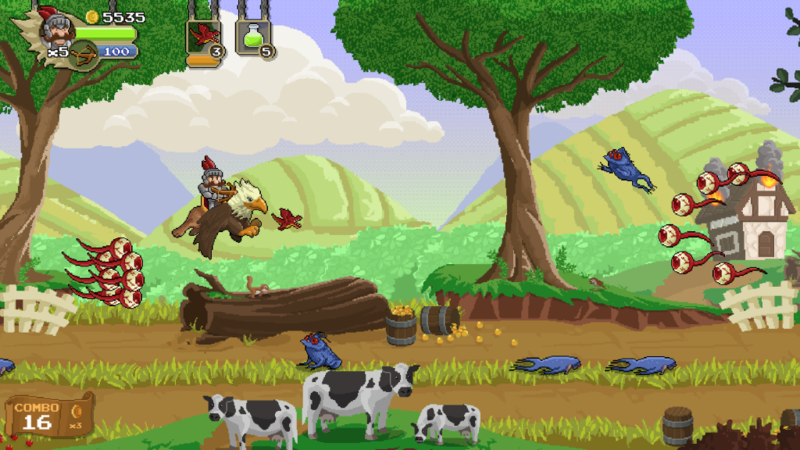 Gryphon Knight Epic, released earlier this month on Steam by developer Cyber Rhino Studios, is very much rooted in the classic days of 2D side-scrollers. It’s relatively simple to pick up, has stunning pixel art visuals and some nice, tongue-in-cheek writing. A personal highlight was the main protagonist shouting “I’ll teach you for crushing other peoples’ dreams!” before beginning a boss battle. Having defeated a dragon, married the princess and settled down in the peaceful kingdom he saved, Sir Oliver is living the dream. But after encountering a spectre claiming to be his evil doppelgänger, Sir Oliver learns that all his old warrior buddies have gone rogue, terrorising their respective lands. 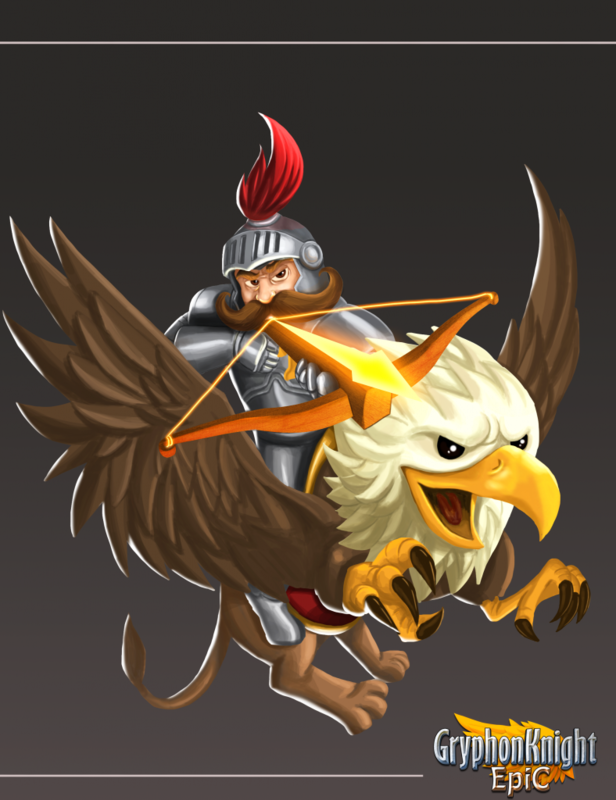 Their betrayal all happening at once seems suspicious, so Sir Oliver takes his trusty gryphon steed Aquila to go find out what evil has befallen his comrades. The gameplay is pretty simple, comprising mainly of changing the elevation of Aquila and firing crossbow bolts in the direction you’re facing. Things are shaken up a little bit when you acquire new weapons and “squires”, which act like defence power-ups, as they allow for a little more strategy other than just dodging and shooting. 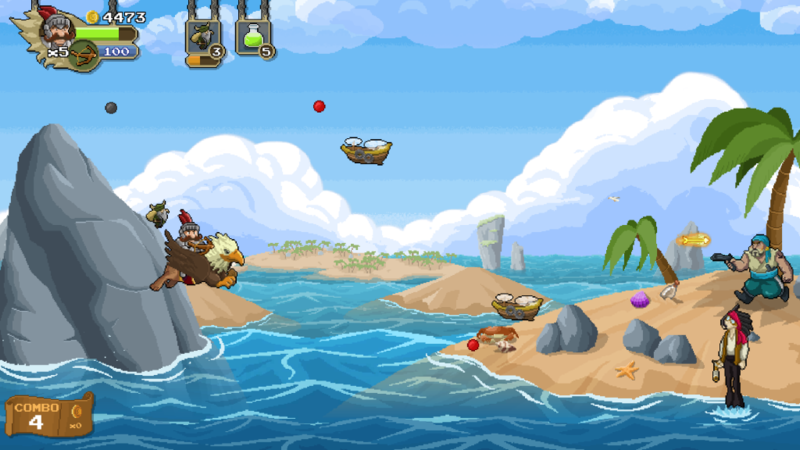 Oh pirates, when will you learn that you too can dodge? Now, even though the gameplay mechanics are simple, that doesn’t mean that Gryphon Knight Epic doesn’t have the difficulty curve of a brick wall. Playing on the mid-difficulty setting, after breezing through the tutorial chapter I was met with a barrage of enemies. The various enemy types are all designed to attack from different angles, to come from various directions and just bombard you with fiery death. It is commendable creativity and game design, but I’d be lying if I said I never felt some intense frustration in repeating the same section for the umpteenth time. Suffice it to say, I lowered the difficulty pretty quickly. A good thing I did, otherwise I would never have made it to see those adorable cows! Have I already mentioned how gorgeous this game looks? I could read my words again and check, but screw it I want to mention it again/for the first time anyway! The level of detail in Gryphon Knight Epic’s pixel art is fantastic, and the smoothness of the character animations makes viewing the game on a 1080p monitor stunning. If it’s one thing I love about 2D side-scrollers is that they can feature strong visuals on low-end hardware. That actually sums up my feelings for Gryphon Knight Epic, a great game to check out if you’re after something to play on a low-end laptop while on the go. It can be played in bursts, doesn’t drain your resources and is good fun. Just turn down that difficulty, otherwise you might throw the laptop at a wall. “2D Side-Scroller Fan” was going to be Tom’s middle name, but his parents had no idea he loved them so much back when he was born. Got any other middle name ideas for him? Hit him up on Twitter, @tomdheath, and let him know. Be sure to also follow LoadScreen on Twitter, @load_screen, and Facebook for more gaming news and reviews.